This post is copied from the Chester County Hall of Heroes. It’s a tribute to my great-uncle Pete, who served and died in WWII. (My Pop also served in the war. And my Uncle Georg served for the German army.) My mother was interviewed for the following article. Walter Archer was born ion July 23,1920 to Howard And Delilah Archer who lived on Wawaset Road in Pocopson Township (between west Chester and Kennett Square. Walter was one of eight children including: Amy, John, Norman, Frank, Earl, Amanda, and Marian. His father was a farm worker, and died when Walter was very young. Walter was inducted into the Army by the Kennett Square Selective Service Board, entering service in December 1942. After basic training, Walter was assigned to serve with the 365th Infantry Regiment, 92nd Infantry division. The division was nicknamed the “Buffalo Soldiers” after their renown predecessors during the late 1800’s in our west. This is the same Division in which hero Herbert Garnett served. 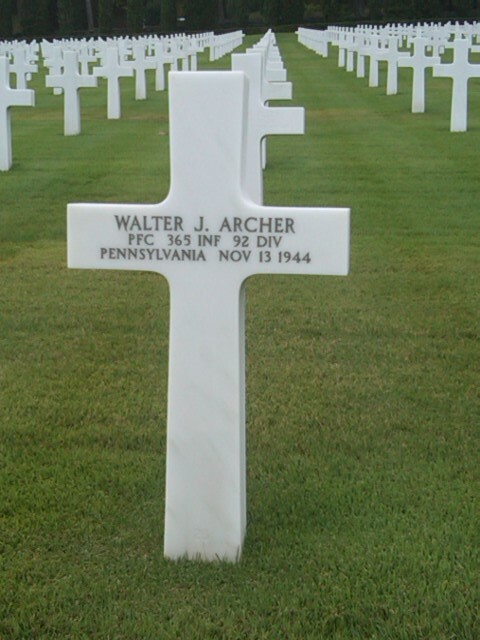 Private First Class Walter J. Archer was Killed In Action on November 13, 1944 in Italy. He was buried at the Florence American Cemetery in Via Cassia, Italy. The family received Walter’s Army issue New a Testament, blood stained and pierced through with a knife or bayonet. The first 9 blood soaked chapters of the book of Matthew were removed before they received it from the government. The family still has the testament today, their only physical memory of Walter (besides his Purple Heart), as no photo exists. http://dsf.chesco.org/heroes/archer/archer.htm (Photos of the Bible and Purple Heart can be found at this link). My sister’s grade school friend recently visited Florence and took this photo for us. Remembering all of the veterans who served for our country. Keeping you in my thoughts and prayers.